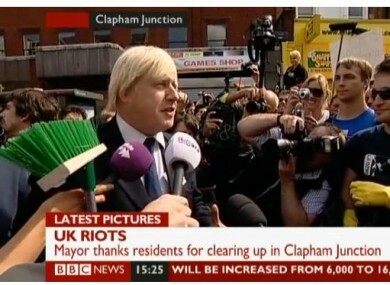 The mayor was heckled as he visited the Clapham Junction area. Meanwhile shops and businesses across London have stayed closed or shut early this afternoon. THE MAYOR OF London Boris Johnson has received a mixed reaction the streets of London today. Johnson, who returned early from his holidays to address the crisis, was greeted with shouts for him to resign as he conducted a walkabout in Clapham Junction earlier today. Residents demanded an explanation for the low numbers of police on the streets last night. Johnson responded by promising “many more police on the street”, echoing Prime Minister David Cameron’s promise of 16,000 officers on the beat tonight. Johnson was later handed a broom as the citizen cleanup got underway in the area, fuelled by a Twitter movement. He is now on his way to Croydon, which was the scene of some of the worst fires in London last night. Labour Leader Ed Miliband has visited Peckham in South London today, while Deputy Prime Minister Nick Clegg has visited Birmingham, where more than 100 people were arrested after looting and violence in the city centre last night. In Ealing police have asked shops to be closed by 5pm and residents to be off the streets by 7pm. The Guardian reports that many stores in the Holloway area are already closed, as are shops and businesses in Peckham and Camberwell. The Telegraph reports that police are prepared to use plastic bullets if violence erupts again tonight. It would be the first time that the measure would be taken on mainland UK. Earlier a man who was shot in Croydon last night died in hospital, while Sky News reports that a man in his sixties is in a critical condition after being attacked in Ealing. Email “London mayor Johnson brandishes a broom on the streets of the city”. Feedback on “London mayor Johnson brandishes a broom on the streets of the city”.